Municipal WWTP reduced cost of sludge removal with Rotomite 180P. SRS Crisafulli. In 1996, the Town of Decaur, Ark., purchased a self-propelled Rotomite 180-P dredging system as part of a new biosolids management program designed to reduce the cost of sludge disposal and to increase solids detention time in-plant. While less than 1,000 people live in Decatur, the town's wastewater treatment plant handles flow equivalent to a population of 40,000. The primary contributor to these flows is a poultry processing plant. Over the last several years, the town's Utility Manger, Rick McClain, had laid the groundwork for planned land application of Class B biosolids. Until early 1996, Decatur had contracted for the removal of pond wastes, which were dredged up by a private firm and hauled away for land application. The total throughput of Decaturs' plant was 2 million gallons per day. The plant accepts combined storm and sanitary flows, as well as the industrial processing wastes of its primary customer. While certain types of trash and solids are more prevalent during storm water events, the plant typically handles large amounts of solids due to the industrial nature of the poultry waste. To remove trash and large solids, flows are screened as they enter the plant. Material then goes through another four-stage process including a primary lagoon where settling occurs, an activated aeration cell, then a second lagoon (polishing pond), ending in a sludge handling pond from which the biosolids are extracted. The town also had two equalization ponds and a waste holding pond. The city's goal was to land apply an estimated 1 million gallons of biosolids each summer season. To accomplish this, the town needed a means of producing consistent solids flow from the final sludge handling pond. The dredge was equipped with an auger/cutterhead and is capable of transferring approximately 800 to 1,000 gallons per minute of biosolids with its 6 inch J-Series sludge pump. The ponds are lined with clay, so Decatur elected to have the dredge fitted with a depth indicator which enables the operator to control the depth of the dredge cut. The dredge is used to keep all the town's lagoons cleaned. Biosolids are dredged for land disposal once a quarter. The dredge is used about once a week on the other ponds. 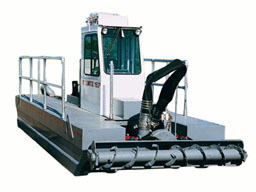 The dredge is propelled by an outboard hydraulically controlled steering. It doesn't need a cabling traverse system. The town uses a crane to move the 12,000 pound dredge from pond to pond. When pumping from the final sludge handling pond, the dredge pumps the biosolids ashore through a floating 8-inch discharge line. With an experienced operator, the dredging operation is capable of producing a consistent percentage of solids at the shoreline. It is not uncommon for the equipment to produce sludge of up to 10 percent solids by weight, or 60 to 80 percent solids by volume. At the shoreline, the biosolids are fed to a waiting truck, from which they will be land applied (surface spread) on nearby farms. One truck equipped with a vacuum pump is used in the operation. There is no surge tank at the shoreline, rather, any overflow is contained and returned to the pond. Decatur expected to save approximately $50,000 a year with a fully operational biosolids management plan. The dredge is powered by a 180 HP Isuzu diesel engine. It is approximately 27 feet long and eight feet wide. While it is designed to be operated by one person, it can carry two people safely. It can excavate to a depth of 15 feet at a speed of up to 10 feet per minute.